For all those people who are interested in the Eurovision Song Contest, here are some details for 2007. The venue for 2007 is the The Hartwall Areena in Helsinki, in Finland. The semi final was held on Thursday 10 May 2007. The final was held on Saturday 12 May 2007. The contest was available on High Definition. The BBC shown the Saturday final in HD. The draw order was held on 12 March. The running order will be decided differently from previous years. Where before, the first country draw will sing first and the next, the first 5 countries picked in the semi final and the first 3 countries picked in the final can select their singing position! This means that those countries can pick any position to sing like last place or half way through the contest or next to a country they love or hate! But it seems that they picked to sing towards the end of the semi final and final. 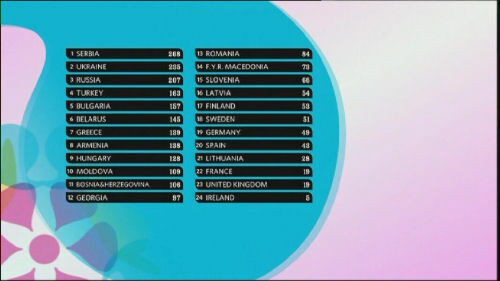 10 Countries qualified from the Semi Finals : Belarus, FYR Macedonia, Slovenia, Hungary, Georgia, Latvia, Serbia, Bulgaria, Turkey, Moldova. Not one country from Eastern Europe went through from the semi to the final. The semi final was broadcast on Thursday 10 May 2007, 2 hours 40 minutes long. The final was broadcast on Saturday 12 May 2007, 3 hours 12 minutes long. Serbia won the semi finals, Hungary finished in 2nd place, Turkey in 3rd place. Please click here for full 2007 details! (Pre Eurovision Night). This detail pages was this page until 12 May 2007. Results of the contest is found later on this page. Don't click away. The Final Table is shown first then the Semi Final Table shown Below. For Background Details to the 2007 Eurovision Song Contest, please click here. For UK Selection Details, please click here. Here are the predictions (by me) regarding the varies of Countries for 2008 contest (before anything else is known). Prediction made on Saturday 12 May 2007 11:50pm. Revised on 17 May. November 2007 : This is now all change! Only The Big Four and the Winner goes to the Final. Everyone goes to the semi final! Other Countries who missed out of the above rules.